Denny Galehouse was born on December 7, 1911, 30 years to the day before Japan bombed Pearl Harbor. For Red Sox fans, however, Galehouse is a reminder of another day of infamy -- October 4, 1948, the date of the infamous playoff game between the Red Sox and Cleveland Indians to decide the American League pennant. For despite a 15-year major league career with the Cleveland Indians, St. Louis Browns, and the Red Sox during which the right-handed pitcher won 109 games and lost 118, he is best remembered in Boston for being the starting and losing pitcher in the playoff game against Cleveland. Ironically, until that game, Galehouse had a well-deserved reputation as a pitcher who thrived in the pressure of the postseason. A native of Marshalltown, in northeastern Ohio, Galehouse grew up in nearby Doylestown, just southwest of Akron. After graduating from Doylestown High School in 1928, Galehouse pitched for several local semipro teams before being signed by scout Bill Bradley of the Cleveland Indians. Galehouse began his professional career in 1930 and spent two seasons with Johnstown in the Mid-Atlantic League, improving dramatically in 1931. He pitched for the Fort Wayne Chiefs of the Central League in 1932 and his 136 strikeouts led the league. His 14-6 record earned him a promotion to the New Orleans Pelicans of the Southern Association in 1933. Galehouse went 17-10 for New Orleans that season and emerged as a top-flight pitching prospect. In the postseason playoff he defeated the Memphis Chicks twice, the second time by a shutout, as the Pelicans captured the Southern League title. Then, in the Dixie Series against Texas League champion San Antonio, Galehouse pitched three times in six days, starting and winning two games, to finish the season with a total of 21 victories. During spring in 1934, Galehouse impressed Indians manager Walter Johnson and earned a spot on the Cleveland roster. He made his major league debut on April 30 against the White Sox in Chicago, pitching one inning of relief in a 20-10 Cleveland loss, giving up two hits, a walk, and two earned runs while facing seven hitters. After that single appearance he was returned to New Orleans. Despite a 12-10 regular season record in 1934, Galehouse had a slightly better earned run average and again emerged as a postseason star for the Pelicans, shutting out Galveston, 2-0, in the finale of the Dixie Series as New Orleans captured its second consecutive Series title. Before the start of the 1935 season, Galehouse was loaned to Minneapolis of the American Association in a deal that landed the Indians outfielder Ab Wright. Galehouse was 15-8 for Minneapolis, and later got into five games for the Indians, including the first start of his major league career, on September 29, earning a 7-4 win in the second game of a doubleheader against the Browns for new Indians manager Steve O’Neill. In the spring of 1936, Galehouse was out of options and reached the major leagues for good. Although he didn’t throw hard, he was an early practitioner of the slider and a pitcher whose success depended upon control. For the bulk of his career he served as a back-of-the-rotation starter and swingman, capable of both starting and relieving. Galehouse went 8-7 in 1936 with a 4.85 ERA in 36 appearances while starting 15 games, and in 1937 was 9-14 while starting 29 games and throwing 200 2/3 innings, second in both categories to teammate Mel Harder. On December 15, 1938, Galehouse was traded to the Red Sox along with Tommy Irwin in exchange for outfielder Ben Chapman, the first of Galehouse’s two stints as a member of the Red Sox. Galehouse went 9-10 in 1939 and 6-6 in 1940 before being sold to the St. Louis Browns. In St. Louis, Galehouse put together the best seasons of his career. In 1942, pitching against rosters depleted by the war, he picked up a career-high 12 victories and 24 decisions. In 1943, Galehouse had a career-low 2.77 ERA, going 11-11 for manager Luke Sewell. In High School baseball mid-May of 1944, the Browns, in need of pitching, persuaded Galehouse to become a so-called “Sunday pitcher.” For the next three months, Galehouse left Akron after his Saturday shift, traveled all night by train to wherever the Browns were playing, pitched the first game of the Sunday doubleheader, then immediately returned to Akron and put in another full six-day work week at the factory before repeating the process the following weekend. In July, when it became clear that the Browns had a chance to win the pennant, Galehouse learned that if he quit his job at the Goodyear plant he was unlikely to be drafted until the fall. He joined the Browns full time for the balance of the season and helped St. Louis capture the pennant and earn the right to play the Cardinals in an all-St. Louis World Series. Galehouse was manager Sewell’s choice to pitch Game One and he didn’t disappoint, scattering seven hits to beat Mort Cooper, 2-1, in a complete game, losing his shutout with two outs in the ninth inning on a sacrifice fly. In Game Five, Galehouse pitched nearly as well, striking out 10 and again going the distance but losing 2-0 after giving up solo home runs to Ray Sanders and Danny Litwhiler. Cooper struck out 12 in the game, and the combined 22 strikeouts, which Cardinals shortstop Marty Marion blamed on the number of fans in Sportsman’s Park’s center-field seats who wore white shirts that day, stood as a World Series record for 19 years before being broken by Sandy Koufax and several Yankees pitchers in Game One of the 1963 World Series. Unfortunately for Galehouse and his teammates, the Browns fell to the Cardinals in six games. Galehouse was drafted into the Navy in April of 1945 and spent most of 1945 pitching for the Great Lakes Naval team in Chicago, which was coached by his old Cleveland teammate Bob Feller. Galehouse rejoined the Browns in 1946 and after a slow start was purchased by the Red Sox on June 20, 1947. Over the next three months, he was terrific for manager Joe Cronin, going 11-7 with a 3.32 ERA. In 1948, under new manager Joe McCarthy, Galehouse resumed his accustomed role at the back of the rotation for the Red Sox, making 26 appearances and 14 starts with an 8-7 record. But when the Red Sox and Indians ended the regular season tied for first place, Galehouse was destined to pitch one more game. One day after the end of the regular season, on October 4, 1948, the Red Sox and Indians met in a one-game playoff in Fenway Park to decide the American League pennant. One day earlier, after the Red Sox beat the Yankees, 10-5, behind Joe Dobson and several relievers, Boston manager Joe McCarthy told the Boston Herald, “Frankly I don’t know who I’ll pitch [in the playoff]…. We had men working in the bullpen all afternoon. I’ll have to find out who did what, who was ready.” Most observers expected McCarthy to pitch either Mel Parnell, who had three days’ rest, was 15-8 for the season and had already beaten the Indians three times in 1948. Ellis Kinder, 10-7, was also well-rested and had won four of his last five starts. In many subsequent interviews, Parnell has said that when he arrived at Fenway that day he expected to pitch, only to be told by McCarthy that the manager had changed his mind and decided to pitch Galehouse, something Parnell always believed was a “total surprise” to Galehouse. Birdie Tebbetts admitted to the author that he was that player sent around by McCarthy, but refused to give any details about what was said to him that evening. “I’ve never told that story and I don’t intend to,” he said. “I’m gonna be avoiding it until I write it myself. I’ve got it on tape.” But neither Galehouse nor Tebbetts ever revealed before either died what truly happened that night. When Galehouse arrived at Fenway Park, he found the ball placed in his glove, McCarthy’s traditional method of letting a pitcher know he was starting that day. Despite the fact that Galehouse was, at best, Boston’s fifth starter that season, there was some logic to McCarthy’s decision. Galehouse had been successful in the postseason and earlier in the year, on July 30, he had pitched 8 2/3 innings of two-hit relief against the Indians in Cleveland. 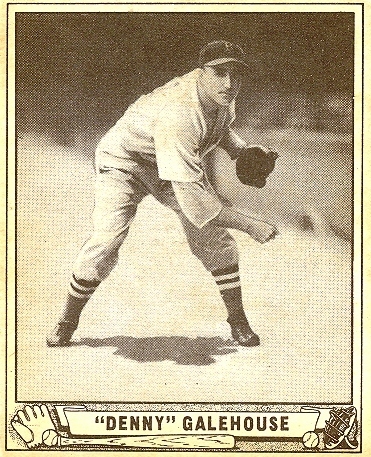 Joe McCarthy later told author Donald Honig that his other pitchers were “all used up” following a grueling regular season and that Galehouse “had pitched a great game against the Indians the last time we were in Cleveland.” In fact, however, Galehouse had made two subsequent appearances against the Indians and been hit hard. Moreover, over the final two weeks of the season he had pitched only twice and been belted each time. Whatever led McCarthy to make his decision, Sox fans know what happened next. In the first inning Galehouse retired the first two Cleveland hitters and then Lou Boudreau hit a wind-blown home run into the net over the left field wall to give the Indians a 1-0 lead. Then Boudreau led off the fourth inning with a single, Joe Gordon followed with a hit, and Ken Keltner hit a home run to give the Indians a 4-1 lead and chase Galehouse. Cleveland pitcher Gene Bearden and his knuckleball held Boston at bay and the Indians went on to win, 8-3, to capture the pennant. Just a few weeks into the 1949 season the Red Sox, as if trying to erase the memory of the loss, released Galehouse. He pitched the remainder of the 1949 season with Seattle in the Pacific Coast League, going 10-12 with a 4.12 ERA, then went 6-7 (4.38 ERA) for Seattle in 1950 before retiring. One of his most notable signings for Boston was St. Louis high school pitcher Frank Baumann. The most sought-after player in the nation in 1952, Baumann was persuaded by Galehouse to sign with Boston for a bonus of $85,000. Unfortunately, Baumann never fulfilled his promise. Yet he was hardly haunted by his performance. Galehouse took great pride in his play during the 1944 World Series, his 11 grandchildren and six great-grandchildren, and in the fact that he earned a paycheck from the game of baseball for nearly 70 years. Galehouse passed away from heart disease on October 14, 1998. The San Diego Padres, for whom he worked for the final 18 years of his career, still honor their top scout each year with the Denny Galehouse Award. In preparing this biography, the author relied on Galehouse's clipping file at the Baseball Hall of Fame, and interviews with Galehouse and others.